Street Fighter II was basically the introduction to the fighting game genre and still plays just as well today when going back to it. The features such as character specific special moves and combining several moves into unblockable combos is a tradition in every fighter today thanks to SFII. Street Fighter III is probably most well known for changing up the cast a bunch, introducing the EX special attack, giving us special moves that can be canceled into super moves and it added a parry system. Though the game took a while to catch the attention of many fighting game fans, it eventually reached a status where fans were more accepting of it in later updates thanks to the bigger cast. Street Fighter IV was a return to the old-school cast along with a few new fighters. Street Fighter IV brought in the focus attack and revenge gauge and reintroduced many of the features from Street Fighter III. Street Fighter IV had tons of updates and in the end it had the most expansive cast in any Street Fighter game. And now, along comes Street Fighter V (SFV). Let's get through the mechanics for the game before I start going over the modes and other content. The game has many returning features from older games such as EX moves and special moves that can be canceled into super moves. Super moves are now called "Critical Arts" and each fighter has only one that can be used once the EX gauge is all the way full. 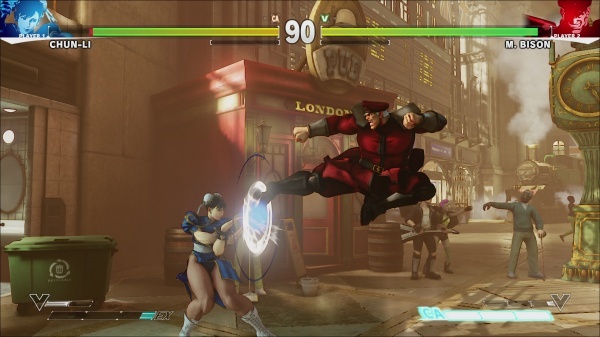 Street Fighter V introduces a V-gauge that charges whenever your fighter gets hit and whenever you perform a V-skill. V-skills and a V-triggers are exclusive to each fighter. The V-skill can be done by pressing both medium attack buttons and it can be performed as much as you like - some fighters can absorb projectiles with this move while some gain an increased mobility move. Pressing both hard attack buttons will perform your V-trigger. V-trigger moves require the V-gauge to be full and will give your fighter some sort of extra special moves, a power-up or a teleport, depending on the fighter. The V-gauge also allows players to sacrifice one bar of the gauge in order to perform a V-reversal - this is performed while blocking an attack and will push the other player off. It's similar to an alpha counter except it doesn't take damage. Street Fighter V has many moves that take white damage from your fighter that is recoverable once you're not under attack. A perfect example is F.A.N.G. 's poison attacks. The white damage is similar to the type of damage that projectiles would take once parried in SFIV. Each fighter is able to counter moves with a normal attack and it will display with a "counter" icon. Counters done with heavy attacks can perform a "crush counter" depending on the fighter. Crush counters have different type of stun effects depending on the attack that counters. Sometimes crush counters will cause a hard knockdown and sometimes they will stun or simply stagger an opponent. A crush counter can set your opponent up for a full combo depending on the type of stun that is achieved. 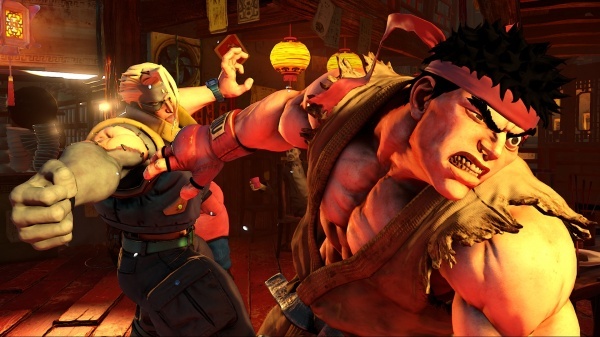 Street Fighter V starts out with a cast of 16 playable fighters. Over half of the cast are returning characters and we have four all new fighters. For returning characters, the game brings in a few fan favorites from the Street Fighter Alpha series, such as Charlie Nash, R. Mika and Karin. Some of the returning characters still play just about the same but some of them have been redesigned quite a bit. Nash and Vega no longer have charge moves and are switched over to the same type of commands as other characters. Dhalsim has undergone some major restructuring with his overall movement and special moves. He can actually be aggressive easier now with his quicker movement and overall tweaks. The new characters all feel unique and bring different playstyles to the table. Necalli and Rashid bring a new form of aggressive gameplay to the game, Laura is a grappler with a short-range projectile and F.A.N.G is a trickster that has an overall defensive style that keeps the opponent out while taking "damage over time" with poison attacks. Even though the starting cast is much smaller than what we just got through with in the final edition of Street Fighter IV, there is a lot of variety here and hidden effectiveness in each fighter. There is supposed to be a new fighter per month added for free in the upcoming months as well - you'll have to purchase the fighter with fight money. The game has about the same graphical style as SFIV, only more detailed. Speaking of easier attacks that I mentioned earlier, SFV is a much easier game to pick up and play when compared to SFIV. Special moves are much easier to perform during combos thanks to the longer stun animations between attacks. You don't have to perform the commands in such a tight window in between moves anymore. I was able to actually perform super attacks after a special move without near as much of a struggle as I usually had while connecting some of Nash's commands in the Alpha games. SFV is overall much more welcoming to newcomers when compared to all of its predecessors. 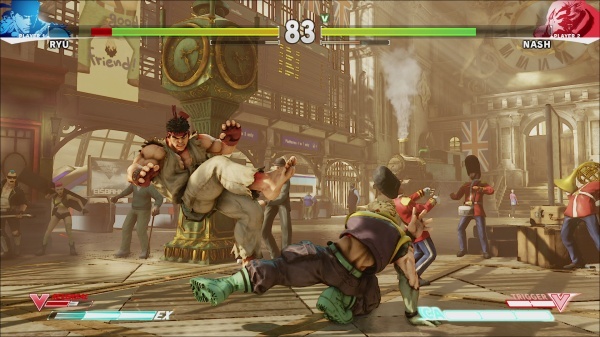 For modes, SFV comes with a story mode, a surivor mode, a training mode and the usual online mode. Story mode is extremely brief. You get to choose between all fighters then go through cutscenes that set up their story. In between cutscenes, you'll engage in a 1-round fight with another fighter. You'll only fight around three opponents per character story. The overall story for each character is only just the prologue of a much greater story that will take place in a future update. With how short the fights are in story mode, they might as well had just made the entire story mode just cutscenes since one round is over so quickly. The cutscenes are presented with artwork and voice acting. The artwork matches Street Fighter extremely well but I can't say the same for character voices. Character voices are a mixed bag. They are either mediocre or appalling. R. Mika's voice makes me cringe every time I hear it since it doesn't match her at all. Survivor mode is surprisingly a lot of fun to play. The mode has four different difficulties that will take you through a certain number of opponents depending on the difficulty that you choose. Health is not recovered between fights but you will accumulate a score based on how well you do and at the end of a fight you will get a list of upgrades and enhancements that you can spend part of your score on to upgrade your fighter for the next match. You can choose from a health replenish, defense upgrade, attack upgrade, full V-gauge and so on. The mode is actually very good for fans of single player modes, but there is one major gripe with the unlockables associated with the mode. You basically have to go through each difficulty with each character in order to unlock the extra outfit colors for that character. You unlock one for easy, three for normal and four for hard. This means you have to fight through 10 opponents for 1 outfit color, 30 opponents for the next three outfit colors and 50 opponents for the final four outfit colors... and all of this is per character. If you lose on any match, you have to start all the way over. As you can see, it's a major grind to unlock all outfit colors. The training mode is your standard training mode that allows you to practice against a dummy character. You can set behavior for your dummy opponent just like in SF4. It would help to have the option to sticky up some of the moves and command attacks below the health bar similar to what MKX allowed since each fighter has several different command attacks to try and its annoying to have to constantly pause the game and then look them up again. The game does have a tutorial mode that it introduces to you on start-up but the tutorial mode is very brief and only goes over basic movement, basic special moves and EX attacks and all attacks associated with the V-gauge. I had to learn about crush counters on my own. There is a challenge mode, extra story mode and a shop that is all coming in another update. SFV has a major lack of content in this first version of game, especially when it comes to single player modes. There is no arcade mode, the story is very lackluster and the tutorial mode is too basic. It's easy to tell that the online modes are still being worked on as well. The game has to be online to play most of its modes - even some single player modes. If you get cut off from Capcom's online service while playing modes such as survival then you'll exit that mode and completely close it out. Matchmaking is steadily improving as the days go by at the moment. I used to have wait quite long in between matches to get another match but they seem to be connecting quicker now. You can set the network options to where the game is constantly searching for a casual or ranked match so that you don't have to sit and wait - it can be activated while on the main menu or while playing any mode. Besides the usual searching for a match, there is also a "Battle Lounge" where players can create a small lobby (2 players) and set conditions for winning such as first to 3, first to 5, etc. There are no lobbies or endless battle options at the moment. The online matches for SFV are basically lag free. If you've been playing the SFV beta then you'll know that the game has no input lag, so fighting online is around the same as fighting offline, which is fantastic. The online for SFV uses a rollback netcode this time and it displays lag as a type of jumpy rollback when lag appears. Basically, you'll be fighting an opponent and your opponent's move will appear to jump around a bit and the fighter might teleport at times. The online is not absolutely perfect, but I'd much rather have the rollback problem compared to input lag. In good connections, there are very few problems with the online. During all online matches and the single player modes, you'll be gaining fight money along with player experience and other unlockables. Fight money can be used in the shop mode... once it becomes available. At the moment, fight money has no use. Stuff like this is honestly the worst negative part of SFV - so much of the game's content hasn't even been released yet. The game feels like you are playing a more upgraded version of the SFV online beta honestly. The overall fighting engine for SFV is quite good and the overall feel of the game is unique enough to make a great next installment in the Street Fighter series, but the game just feels incomplete overall. For a $60 game, SFV is a very lackluster experience at the moment. If you're willing to wait through all the updates this year, SFV is most likely going to be a really, really good fighting game. There is no doubt in my mind that this game is going to be just as good as SFIV in its final form once it is fully updated but right now, the game is just lacking in so many areas. - So many features that are "coming soon"
Street Fighter V is an overall good step forward for the SF series when it comes to gameplay features and it has a bright future ahead of it, but right now the game is lacking so many modes that SFIV had at launch and seeing the "coming soon" message gets tiresome - it makes me think I'm still playing a beta version of the game. Final Rating: 74% - Feels more like an incomplete beta than a full release.